Past 2001 NCAA champion Adam Tirapelle, an Illinois alum, joins On The Mat with Kyle Klingman and Andy Hamilton. Tirapelle coaches high school wrestling with his father Steve at California powerhouse Clovis. 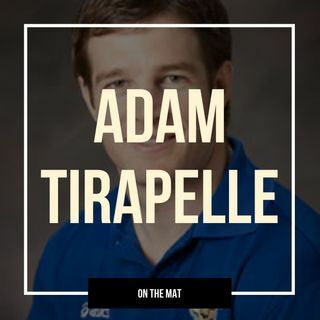 6:20 - Adam Tirapelle, one of the brightest minds in wrestling. 7:20 - Live mailbag items - Scott Honecker and ... See More Mike DeRoehn. “On the Mat" is a presentation of the National Wrestling Hall of Fame Dan Gable Museum and is hosted by the Director of the Dan Gable Museum, Kyle Klingman, and Trackwrestling Content Manager Andy Hamilton. Check out the greatest accompaniment to the NCAA Division I Championships, and it's Mat Talk Online's NCAA Division I Championship Preview Guide at WrestlingPreviewGuide.com. This link provides listeners of this show a $5 discount off the retail price. It's everything you'll need to know about every athlete in the NCAA championships coming up in Pittsburgh. And if you're a fan of the extensive and broad-based reach of the shows on the Mat Talk Podcast Network, become a TEAM MEMBER today by going to www.patreon.com/mattalkonline. There are various levels of perks for the different levels of team membership. If you like wrestling content -- scratch that -- if you LOVE great wrestling content, consider becoming a team member. You'll get some cool stuff too.